There are many characteristics college football coaches search for in their future players. Athletic – fast, strong, powerful, etc. This is by no means an exhaustive list but merely the foundation for which a college coach looks to invest in a player. Naturally this list of characteristics forms a great high school player and young man as well. Athletes who display these traits and make an effort to develop them during their high school years create options for themselves. 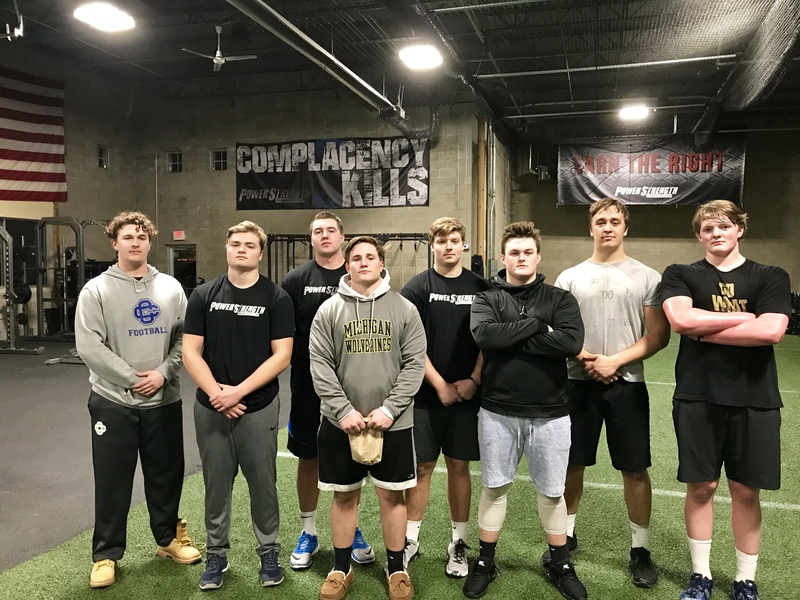 Not all of the athletes we see at PowerStrength will go on to play college ball, but it is our goal that they all create awesome memories in high school from doing their best on the field. This was the goal of Stuart Kettler. But Stu also had a dream of playing Division 1 football. 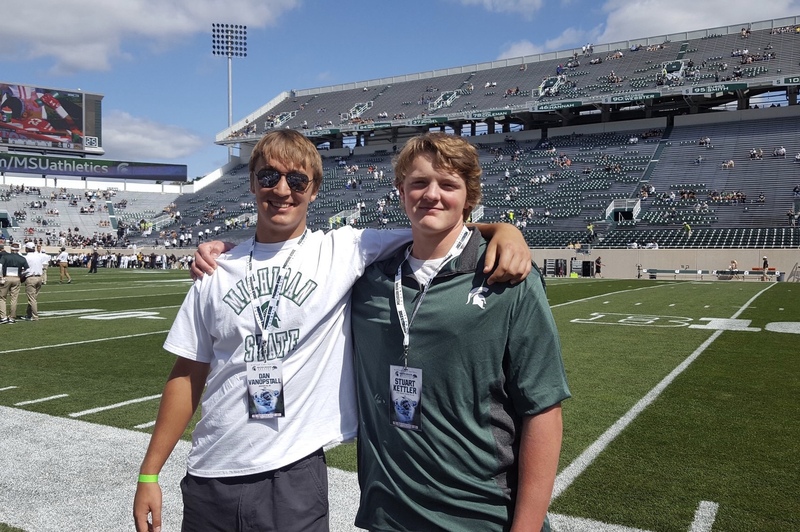 Stu (right) and fellow PSTS linemen Dan VanOpstall (left) on a visit to Michigan State. Dan is a year older than Stu and will be walking-on at MSU next season. They both influence and sharpen one another and the impact is invaluable. Take a look back to the list above and Stu had a lot of those qualities. There are a lot of athletes who are good students who demonstrate high-character and leadership. Some are even bigger than others, and some are the strongest and fastest. But it doesn’t mean they’ll play Division 1 football. Stu had them all, except he needed to develop as an athlete. Stu taking notes during a Premier leadership talk. I’ll never forget Stu’s first day during his Trial Workout. 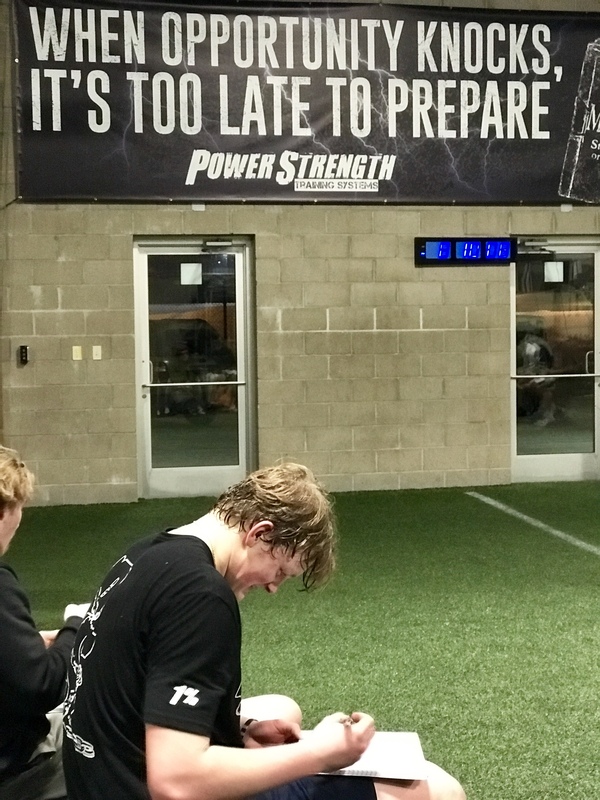 After the warm-up, he was covered in sweat and breathing hard (nearly every new athlete is like this on their first day as they aren’t used to the high volume of general work we implement in the warm-up). I took him through some basic movements, starting with his squat technique. No weights, just Stu, a wall, and a very high box. His strength and limited control showed me exactly what we had to work on. It also painted a nasty picture of what he probably looked like with weight on his back (ouch). We paired this with a basic upper back exercises with a band. No matter the sport, every high school athlete needs more upper back attention, especially taller, developing athletes with poor posture. Set of 10-15 reps of this revels plenty. After we worked up to using a light 44lb kettlebell on the squat, we moved on. Next, we paired push-ups with a body weight split squat. I told Stu to do 10 push-ups and I wasn’t going to coach him at all. I wanted to see what his natural technique looked like and where it broke down. If an athlete continues with poor technique in training it will probably get him injured, as well as limit his potential. Engraining proper technique with any athlete, especially younger athletes is vital. After showing him the proper position and technique, Stu maxed out at 5 “good” push-ups. Also, not uncommon for many HS athletes as they mask their poor technique with more “effort.” This effort gets them through the workout, but it doesn’t necessarily make them better. Attention to detail is everything. Then Stu took a knee and I told him to stand up into a split squat. This can be tough for taller athletes, but it’s showing me strength/control through the movement along with flexibility (or lack thereof) in the hips. We added a 4-inch foam pad on the ground so it would limit his range of motion because he couldn’t maintain his balance without it. This was with bodyweight only and 6 reps per leg revealed a lot. We finished the session with some more exercises to get him moving in athletic positions. This assessment showed us plenty physically. But throughout this time, we are assessing more than just athleticism – that’s the easy part. We want to see how the athlete listens. Do they quit when it gets tough? Can they pay attention when fatigue sets in? How bad do they really want it? Do they stay positive or do they get negative when the results aren’t immediate? Stu was hard on himself but focused on every rep to make sure it was better than the last. We told Stu that if he continued with this mindset, the results will follow. After a month of proving himself, we granted Stu access to join our Advanced Premier Football group. He was one of only a few sophomores in the group made up of college-bound juniors and seniors. Physically he was at the bottom. But Stu came to work every day. And every day he stayed after doing extra push-ups, chin-ups, and stretching. Every day he had a pre-workout snack and a post-workout shake. Stu did this 3-5x per week for the next 8-months until the start of his junior season. Despite this focus and dedication, Stu still received plenty of doubters and naysayers. As soon as someone starts to see a little success there will always be others trying to hold them down. This (unfortunately) is human nature, especially in high school. Other athletes gave Stu a hard time about his progress and all the extra work he was putting in. They doubted him and his dream. This pathetic feedback only provided further motivation. He was surrounded by other athletes at PSTS that were just like him and showed him that it can be done. Stu remained hungry and humble, and we are prouder of him for displaying this perseverance than anything else. Stu and other area linemen that are leaders on their teams, but come together to sharpen one another. Stu was everywhere last summer and through his junior season. Camps, recruiting visits, and campus tours – this was a regular part-time job for Stu and his family. He was doing the work on the field, in the classroom, in the gym, and on the recruiting trail. And he had zero offers after his junior season. But he kept at it and trusted the process. 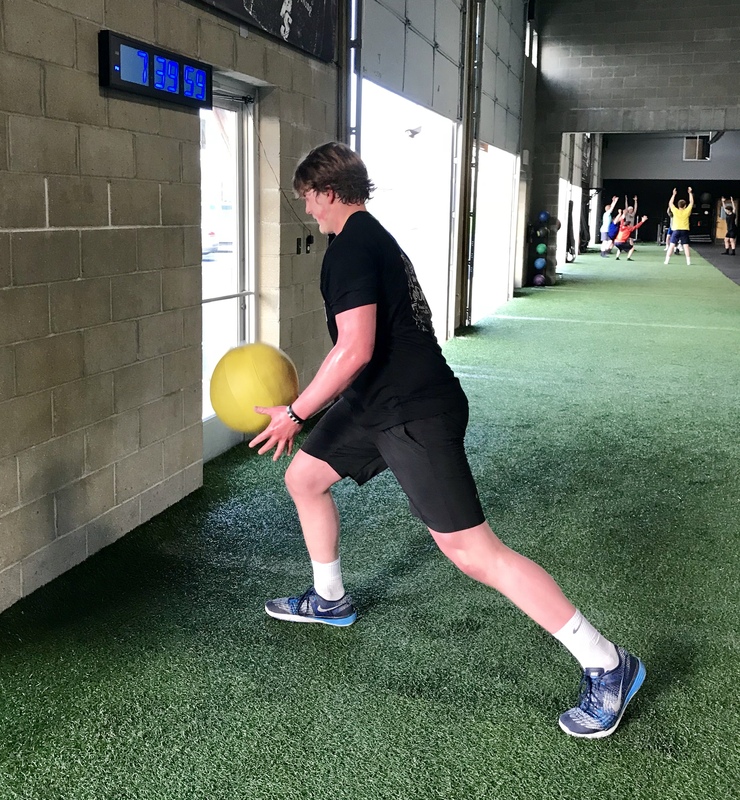 15-months after his first PSTS workout, he received his first Division 1 offer to play college football. This means a full-ride scholarship. This means his dream was becoming a reality. 18-months later, Stu has 4 division 1 offers with other offers and interest from 10 other schools. He is far from the athlete who first walked in our doors – Stu made sure of that. Stu is now 6’5 and weighs 275lbs. 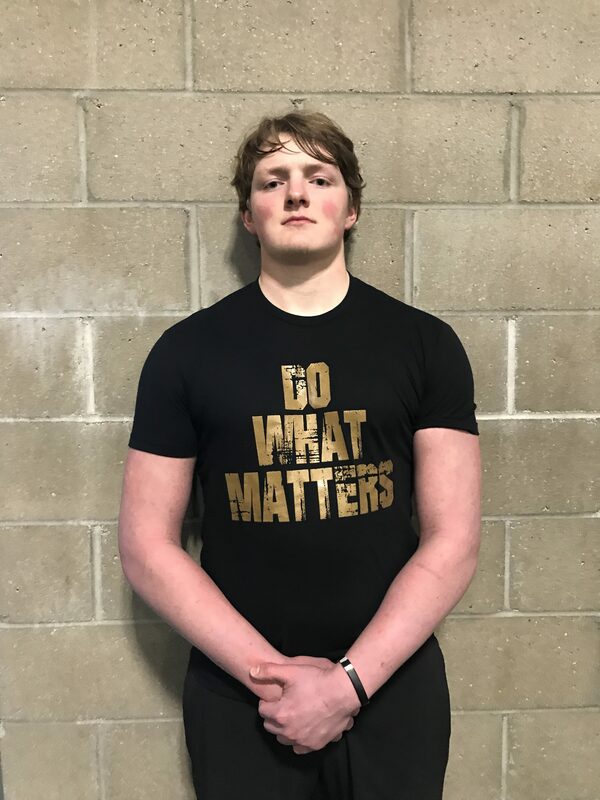 He’s gained muscle, dropped over 4% body fat, and got rid of the “skinny-fat” body type so many high school linemen have. He went from 5 push-ups to 20 push-ups with 2 chains (40bs). Went from benching 185 for 1, to benching 225lbs for 10 reps! Dropped over 2 tenths on his 10yd sprint. Added 5-inches to his vertical jump. Added over 12-inches to his broad jump. And unlike most high school linemen over 240lbs, he can actually do multiple chin-ups. Stu is currently still in our Premier Advanced Football group, but now he’s far from the bottom of the totem pole. He trains 4x/week and is a leader within the group. He also attends his team workouts at least 2x/week as well. His schedule is still packed with recruiting visits but he handles that like a pro, while continuing to do well in the classroom. Stu is gearing up for a big summer and to make awesome memories during his senior season. This transformation story is inspiring and the best part is that it’s still happening. Stu will have at least another 14-months of preparation before he steps foot on a college campus. He is his own critic and motivator. With his disciplined work habits, growth mindset, and patience – it will be a story you’ll want to keep paying attention to. The future is bright…and big…and strong…and powerful…. How many other athletes are out there that had the same frustrations as Stu? He provided the road map and the example, now it’s just a matter of taking action and follow-through. If you know someone who could benefit from reading Stu’s story, please share the link with them.